The airport near Orlando was shut down for close to two hours after officers arrested the man. A 22-year-old student pilot suspected of boarding a vacant passenger plane at a central Florida airport early Thursday has been charged with criminal attempt to steal an airplane, officials said. 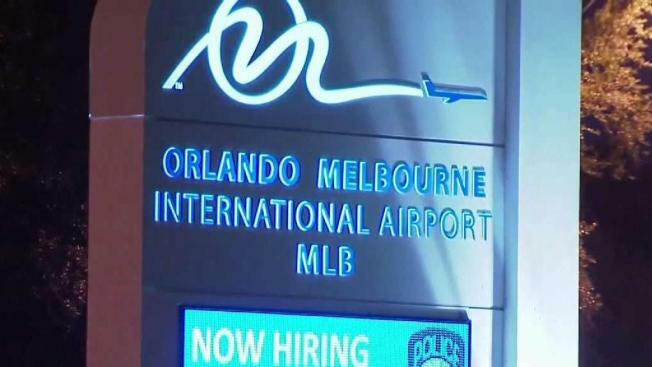 The Joint Terrorism Task Force is investigating and trying to determine a motive in the case, according to Orlando-Melbourne International Airport spokeswoman Lori Booker. She told news outlets the student pilot, whose name hasn't been released, also faces a visa violation and criminal trespassing charges. Early Thursday, a man drove to the curb outside the airport, left his car running, hopped a fence and boarded an Airbus 321 American Airlines aircraft sitting in a maintenance facility, Booker said. An avionics technician was in the plane's galley when he saw a shadow, Booker said. "He turned around and said, 'Who are you? Show me your badge," Booker told news outlets. She said the technician was among airport workers she dubbed heroes. He grabbed the man and, with help from another technician, they got him off the plane. Booker said that while one technician held the man down, the other called Melbourne airport police. The man broke free and ran along the airfield before police took him into custody about two minutes later. After the man was arrested, officials conducted a sweep of the airfield before re-opening the airport. All employees and passengers were removed from the terminal during the incident, which caused two flight delays and interrupted airport operations for about five hours. Police searched the student pilot's car with a robotic arm to make sure no explosives were inside, Booker said. The car was then towed from the airport. The airport returned to normal operations after five hours. Booker said the student pilot is from Trinidad and entered the United States through Canada. The spokeswoman said he has a Florida driver's license but did not know whether he was enrolled in a local school. Melbourne is 70 miles southeast of Orlando.